I have many News paper Clippings Saved by my Aunt Irene (& a few by myself) as I type them up I'll add them here. If you have any you'd like to share PLEASE feel free to send them to me & I'll post them here too. Andrew Myers was born about May 29, 1797 in Pennsylvannia and died January 22, 1881 at the age of 84 years, 7 months and 11 days in Harvey County Kansas at the home of his daughter Margret Myers Commons. Jerry Hagge, whose wife is a Myers descendant, shared the following obituary with Jill & Nadine: Andrew's Obituary as printed in The Aledo Democrat-Friday, Feb. 11, 1881 simply read: "Col Andrew Myers of New Boston, died at the residence of a daughter of his in Kansas a few days since, at the advanced age of 85 years. The remains were brought to New Boston for interment by the side of those of his wife, who passed from the earth *three years ago". William Perry Myers, who died September 25, 1909, at the residence of his daughter, Mrs. Ora Nelson, in this city (New Boston), was the second of nine children - seven daughters and two sons - born to Col. Andrew Myers and Mary (Lloyd) Myers. Of these only three survive: Mrs. Jane Mannon, Whittier, California, Mrs. Mary Kirlin, Chicago and Levi W. Myers, Portland Oregon. The subject of this sketch (picture was included) was born December 13, 1820, near Tarlton, Pickaway county Ohio. A few years later the family moved to Wayne county, Indiana and in 1836 they moved again, overland (trip occupying one month), to Mercer county, Illinois. December 12, 1852 he was married to Louisa Brown Larrance, daughter of Jonathon and Elizabeth (Swafford) Larrance. To them were born seven children , five of whom survive: Myron A. Myers, of Hinsdale, ILL.; Horace G. Myers of Rochester,N.Y. ; Mrs. A.M. Sayers, of Western Springs, ILL.; William Lloyd Myers, of Chicago, and Mrs. J.O. Anderson of LaGrange, ILL. Mary Orline and Earle Larrance died in infancy. Louisa B. Myers died February 22, 1872. In 1873 Mr. Myers was married to Mrs. Mary Matson. To this union was born three children: Charles Clyde, who died in infancy: James T, of Rochester, N.Y., and Mrs. Nels Nelson, of New Boston, ILL.
Funeral services were held at the residence of Mrs Nelson at three pm Sunday, September 26 (I think, the print is not clear), Rev. W.C. Perigo of the Christian church officiating. Two hymns which the deseaced particularly loved, "Jesus Lover of my Soul." and "God be with You till We Meet Again," were sing most sympathtically by Mrs. Dora Shields, Mrs. Hattie Prouty and Roy Ballard. Mr. Perigo's re-(part of page missing here) their conciusion the eldest son, Myron A., expressed the heartfelt thanks of the family to all who had shown kindness toward the deseaced during his later and declining years. The pall bearers were the three older sons, A.M. Sayers and Nels Nelson, sons-in-law, and Arthur Mannon nephew. Internment was in the New Boston cemetary. Mr. Myers led an active and meaningful life. As a young man he farmed, taught school, worked in coal mines and lumber camps in Wisconsin. Immediately after his marriage he located on a farm two miles north of New Boston, where he resided until 1864, when he moved to the city of New Boston. That place had been his home until the day of his death, although he spent much time with his children in and around Chicago and Rochester, N.Y.. He was a delegate to the first National Republic convention, held in Phiadelphia in 1876. Of the delegates that attended that convention not more than two or three are living. He was an ardent Abolitionist, detesting slavery and every form of oppression with his whole being. He was sympathetic and was always helping those whom he thought needed help and he was most charitable in his estimate of men and while seeing the good was inclined to find an excuse for their shortcomings, in addition to the sisters and brothers and children before mentioned there are thirteen living grandchildren. Passed on to the higher life Feb.22,1872, in the 41st year of her age, Mrs. Louisa B. Myers, wife of William P. Myers and daughter of Jonathan and Elizabeth Larrance. Mrs. Myers came to Mercer County,Illinois with her parents from Henry County,Indiana in 1835, when she was but 4 years of age and was married married to Wm. P. Myers 1n 1852 . She was a woman of more than ordinary intellect and culture. Her mind was well imbued with and she took a lively interest in all the reform measures of the day. The large concourse of people who attended the funeral , well attested their appreciation ofher useful life. A husband , 6 children and 2 brothers are thus deprived of a loving and faithful wife, a kind and tender mother and an affectionate sister. Mary Elizabeth Westerblo, second of ten children born to Mr. and Mrs.Andrew Westerblo, was born Jan 19 1843 in Sweden and died at the home of her daughter Mrs Nels Nelson on Thur Sept 20 1917; aged 74 years, 8 months and 1 day. She came to America in 1852 and settled near Andover, this state. In 1859 she was united in marriage to Peter Mattson, and to this union two children were born, namely; Alice, now Mrs Albert Martin and Julius Mattson, of this city. Mr. Mattson died in 1870. Mrs Mattson was married to Wm P Myers in 1873. three children were the fruits of this union, viz: Charles Clyde, who died in infancy, James T and Ora, now Mrs Nels Nelson with whom Mrs Mattson had made her home for several years. The husband died 8 years ago. Besides the four surviving children Mrs Mattson's death is mourned by Mrs. Caroline E. Lawson of Hepburn, Ia, the only one living of her brothers and sisters. Mrs Lawson was present at the funeral. Twenty-one grandchildren and 22 great grandchildren also remain. On account of illness, one son, James, of Rochester, NY was not able to attend the funeral. Mrs Myers had been a member of the M.E. church and the Ladies Aid of the church for many years. She was a loving Mother,always doing for her children and was a good neighbor, ever willing to help those in need. She is sadly missed by her loved ones. Funeral services were held at the home of Mrs Nelson at 2 p.m. Saturday Sept 22, being conducted by Rev A.A. Waters , paster of the M.E. Church. Three songs,"Sleep Thy Last Sleep", "Rest in Peace" and Silently Sleeping" were sung sympathatically by Mrs Jetta Roberts, Mrs Hattie Prouty, Frank Poffenbarger and Roy Ballard. Mrs Roy Ballard presided at the organ. The pallbearers were: Lester Nelson, Lloyd Nelson, Clyde Mattson, (three of her grandchildren) John Biggs, George Baker and Oscar Nelson. Interment was in the New Boston Cemetery. Weep not that her toils are over, Weep not that her race is run, God grant we may rest as calmly when our work, like hers, is done. Till then we yield with gladness Our mother to him to keep, and rejoyce in the sweet assurance "He giveth his beloved sleep." Those present from a distance at Mrs Myers funeral were : Mrs Caroline Lawson of Hepburn, Iowa; Mrs P.G. Nelson, Misses Hattie and Bessie Nelson and Oscar Nelson of Galesburg. MYERS - William Lloyd Myers, Dec 31, 1913, aged 50 years, beloved husband of Josephine Friesleden Myers, brother of Myron A., Horace G., James T., Mrs. A.M. Sayers, Mrs. Lillie L. Anderson, Mrs. Ora Nelson. Funeral 2:30 p.m. Friday, Jan 2, 1913 from late residence, 321 Ingle-side Ave; burial private. The funeral of Myron Albert Sayers, 14 years old son of Albert M. and Grace D. (Myers) Sayers, who died of heart trouble, last Wednesday morning, was held at the Baptist Church last Friday afternoon at 2 o’clock. The pastor, Rev. W.L. Jaeger, preached from the text. “What I do thou knowest not now, but thou shalt know hereafter”. Every available space in the church was occupied. The High School came in a body to pay tribute to Myron, who at the time of his death was a member of the Sophmore class. Myron Albert Sayers was born in Western Springs, Illinois on July 7, 1906, and died at Fountain, Colorado, May 4, 1921, at the age of 14 years, nine months and 27 days. His illness covered a period of nine and one half weeks, during which time he suffered greatly but with the utmost fortitude. He was of an unusually cheerful disposition, and brimful of wit, which caused him to be loved by all who knew him. In High School he had few equals and no superiors, as a student, while his popularity among students and teacher unexcelled, The same was true in the Baptist Sunday School, where he was treasurer of the Baraca Class, and performed the duties of his office as a real business man would. He leaves behind a father, mother and an older brother, Bruce, and an 86 year old grandfather. New Boston - Funeral services for Mrs. Nels Nelson 70, lifelong resident of New Boston community, who died at 8:50 o'clock yesterday morning in her home in New Boston township, following several months of illness, will be held at 2 o'clock tomorrow afternoon at New Boston Methodist Church. The Rev J. Millard Ahlstrom, pastor of the church will officiate. Burial will be in the New Boston cemetery. The body is in Olin funeral home. Friends may call this evening. Mrs. Nelson, the former Mary Ora Myers, was born April 6, 1878, at New Boston, a daughter of William and Mary Westblo Myers. She was married October 28, 1898 in Oquawka to Nesl Nelson. Surviving are the widower; a daughter Irene at home; five sons, Earl at home, Lester of Monmouth, Earl (should have read Carl) and Lloyd of New Boston, and Ellis of of Joy; 17 grandchildren and three great grandchildren. Funeral services for Mrs. Nels Nelson, 70, who died at her home in the Swan Lake neighborhood on Sunday morning, were held Tuesday at 2 pm from the New Boston Methodist Church with Rev. J. Millard Ahlmstrom officiating. Burial was in the New Boston cemetary. Mrs. Nelson had been ill for several months. She was born in New Boston on April 6, 1878, a daughter of Mr. and Mrs. William Perry Myers, and was given the name Mary Ora Myers. She was married in Oquawka to Nels Nelson on October 28, 1898, and he survives, together with a daughter Irene, at home and five sons: Earle at home; Lester of Monmouth; Carl and Lloyd of New Boston and Ellis of Joy. There are 17 grandchildren and three great grandchildren. New Boston - Nels Nelson, 90, a farmer in the Bay district northwest of New Boston, died at 11:45 pm Wednesday, (December 16, 1953), at Hershey hospital in Muscatine, Iowa. Funeral services will be conducted Saturday afternoon at the New Boston Methodist Church, by the pastor, Rev. John Keller. Burial will be in the New Boston cemetery. The body is at Olin mortuary, New Boston. Music at the funeral was by Lura Stead and Grace Histed. Flower attendants were Mrs. Harley Bear and Mrs. Lollie Willits. Mr. Nelson was born April 11, 1863, in Sweden a son of Andrew and Ella Nelson. He has been a resident of New Boston for the past 60 years. He and the former Ora Myers were married October, 1897 in Oquawka . She prececed him in death. Survivers include: five sons, Carl and Earle of New Boston, Ellis of Joy, Lester of Monmouth, and Lloyd of LaSalle; a daughter Irene of New Boston; 19 grandchildren and four great grandchildren. Nels Nelson, 90, farming in the Bay district northwest of New Boston, died at 11:45 pm Wednesday, December 16, 1953, at Hershey hospital in Muscatine, Iowa. Funeral services were held Saturday afternoon at the New Boston Methodist Church, Rev. John Keller officiating. Burial was in the New Boston cemetery under the direction of Olin funeral home. Music at the funeral was by Lura Stead and Grace Histed. Flower attendants were Mrs. Harley Bear and Mrs. Lollie Willits. Mr. Nelson was born April 11, 1863, in Sweden and came to America at the age of 17. His parents were Andrew and Ella Nelson. He has been a resident of New Boston for the past 60 years. He and the former Ora Myers were married in Oquawka in October, 1897. She prececed him in death. Surviving are five sons, Carl and Earle of New Boston, Ellis of Joy, Lester of Monmouth, and Lloyd of LaSalle; a daughter Irene of New Boston; 19 grandchildren and four great grandchildren. The Oregonian April 8, 1923 COMMONS- The Funeral Services Of The Late Clara R. Commons Who Died In This City, (Portland) April 5, 1923 Aged 57 Years 11 Months 8 Days Beloved Wife Of Levi M. Commons Will Be Held Tomorrow (Monday) At 2 P. M. In The Chapel Of, Skewes Undertaking Company, Corner Of Third And Clay Streets. Friends And Members Of, The United Artisans Assembly No. 3 Invited To Attend. Interment Columbia Cemetery, Portland, Oregon. Clara was the wife of Levi Commons. Levi was the son of Margaret (Myers) and Enos Commons, and grandson of Mary (Lloyd) and Col Andrew Myers. NEW BOSTON - Carl R. Nelson 51, of New Boston, died yesterday at the Town and Country Bowling Alley, Aledo, apparently due to a heart attack. Funeral Services are pending at the Olin Funeral Home, New Boston. Friends may call at the Funeral Home after 10am tomorrow morning. Burial will be in the New Boston Cemetery. Mr. Nelson was born on November 12, 1919, in New Boston, a son of Nels and Mary Ora Myers Nelson. He lived in the New Boston Community all his life where he operated a farm. He married Marie Cooley, May 10, 1941, in Kahoka, MO. NEW BOSTON - Funeral Services for Carl Nelson, 51, of New Boston, who died Saturday at The Aledo, Town and Country Bowling Lanes, will be at 2 tomorrow in the New Boston United Methodist Church. Burial will be in the New Boston Cemetery. Friends may call at the Olin Funeral Home in New Boston. (Son of Pete Mattson & Mary Westerblo Mattson Myers, Step Son of William Perry Myers) Julius Farrow Mattson was born March 20 1865 , at Swedetown one mile north of New Boston and died at 10 am July 30 1931 at the age of 66 years, 4 months and 10 days. He was the son of Peter and Mary Westerblo Mattson. He was married to Eva Carlstrom, daughter of Chas and Clara Carlstrom on Aug 19 1891, in the home of S.V. Prentiss. To this union five children were born, Clyde G., New Boston, Victor O. Hammond Ind, Dora Baker, Alexis, Ivon A. Hammond Ind and Ruth Bear New Boston.Other surviving relatives are Mrs Alice Martin who lives on a farm near Eliza, a half sister, Ora Nelson, who resides on a farm in Bay Island, and a half brother James Myers of Rochester N.Y., also seven grandchildren. Julius had always resided in the vicinity of New Boston. He was a farmer and teamster all of his life. Funeral services were held in the M.E. Church Saturday at 2 P.M. with Rev Wade Smith in charge. The pall bearers were Ed McNall, William Welch, Robert Chinery, Charles Ives, Charles Hyser and John Bustard. Interment was in the New Boston cemetery. Clyde Mattson of Aledo was killed instantly about 3PM Saturday went he car he was riding in ran off the road on a curve about one mile north of New Boston on route 17 and turned over. Funeral Services were held Tuesday April 3 1956, for Mr Mattson. He was 64 years of age. Rev John Keller officiated. Burial was in the Aledo Cemetery. Pallbearers were Robert Fullerton, Carl Brown, Lee Stephens, V.G. Blythe, Dean Shaw and William Brook. The singers were Mrs Earl Kistler and Mrs Myrtle Bridgeford. Rites were held at the Reiser Funeral home. Mattson was born March 4 1892, in New Boston, a son of Ceaser and Eva Carlstrom Mattson. He waas educated in rural and Mercer Schools. He was first married to Elizabeth Hund and later married Pearl Briscoe. He was employed as a machinist at the Rock Island Arsenal for several years and at the Viola Sales and Engineering. He was of Baptist faith and was a member of the Off Fellows Lodge at Keithsburg. He also belonged to Modern Woodmen of America and A.f.L. 81 of Rock Island International Association of Machinists. Survivors include his wife, his son Warren, two daughters, Mrs Mary Peterson of San Francisco, Calif and Mrs Vera Changas of Rock Island; five grandchildren, one great grandchild; two sisters, Mrs Dora Baker of Alexis and Mrs Ruth Bear of Rock Island; and a brother Victor, of East Chicago. He was preceded in death by his parents and a brother. Widely Known Inventor Of Labor Saving Farm Implements To Rest Wednesday. Linden Kirlin, widely known as the inventor of the farm implements which bear his name, died late Monday at his home in Beattie, a victim of heart disease. Mr. Kirlin had been in failing health for a year and bedfast for three weeks. Complications developed to hasten the end. Funeral services were conducted at the family home at 3 o'clock Wednesday afternoon. Mrs. E. S. Thompson of the Marysville Christian Science church officiating. Burial was in the Beattie Union Cemetery, beside his wife, who died July 11, 1930. Mr. Kirlin's name was already known to fame when he came to Marshall county in 1883 and it shone with added luster through the years which followed as the work of his inventive genius was unfolded. Mr. Kirlin's first creation was the riding cultivator, which was instantly received as a blessing by farmers who had been plodding back and forth across their fields. This was in the early seventies. Then came a combined lister and drill in 1878, followed by a two row knife cultivator for listed corn in 1882, a two row disk cultivator in 1887, a two row wheel and runner disc cultivator in 1902, and a wheel and tongue cultivator in 1903, all bearing the Kirlin brand. It has been said of Mr. Kirlin that his inventions have been the means of paying off more farm mortgages in the corn belt than any other agency devised by man. The idea for his first invention, the riding cultivator, was born of pain and suffering. It was while Mr. Kirlin was walking up a corn row behind an old fashioned cultivator on his old home place in Mercer county, Illinois, that he suffered a severe attack of rheumatism. In the paroxysm which followed he visualized a plow with two large wheels and a seat slung in between. A blacksmith friend helped him to hammer the vision into a reality. From that time forward most of his waking hours were dedicated to a solution of the manifold problems which confronted the tillers of the soil. A practical farmer himself, he knew what most was needed to increase efficiency, cut down expenses and break the monotony on the farm. His ideas were all practical, and being far in advance of the times, they brought him handsome returns with which to continue his experiments. Mr. Kirlin moved to Brown county, Kansas, in 1879, and he came on to Marshall county four years later, purchasing a quarter section of land in the southeast part of the county. In 1893 Mr. Kirlin opened a cultivator manufacturing plant and wholesale house at Beattie, and three years later he moved to town to give closer supervision to the business. By 1900 the business had reached such great volume that he transferred the plant to Kansas City. He remained in charge of the concern in Kansas City, with marked success, until 1913, when he returned to Beattie to spend the remainder of his life. In 1915 Mr. Kirlin brought forth a shock absorber for Ford cars. This invention was known as the "Kirlin road smoothers" and was used quite extensively for a time. One year later he perfected an attachment for the old runner cultivator which greatly revived the use of that machine. Mr. Kirlin was married with Miss Blanch Estelle Mitchell of Keithsburg, Ill., in 1871. To this union three sons and two daughters were born, all of whom survive. They are: Ward Graham Kirlin of Kansas City, Claire Ernest Kirlin and Jacob Orr Kirlin, both of Beattie, Mrs. Eva Maude Thomas of Norman, Okla., and Miss Grace Belle Kirlin of Beattie. He also leaves two sisters and a brother, Miss Elva Kirlin of Beattie, Mrs. Alma Crabbe of Albert Lea, Minn., and Ivan Kirlin of Beattie, also eleven grandchildren and two great-grandchildren. Mr. Kirlin was born at New Boston, Mercer county, Ill., September 22, 1848, hence his exact age was 83 years and 27 days. Their future hope by that for which he strove. Shall not return to take our hand again. Stanley E. Histed was born in Davenport, Iowa, April 24, 1924. He attended the Davenport schools and graduated from Davenport High School with the class of 1942. While in high school he was a lietenant in the R.O.T.C. Immediately after graduation he was employed by the U.S. Engineers at Rock Island, Illinois, and Skagway, Alaska, until he left there to volunteer in the service of his country. 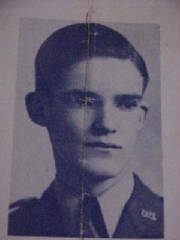 He entered the army at Camp Dodge, Iowa, on August 21, 1943, and was assigned to the Air Corps. He trained at Sheppard Field, Texas; Lubbock, Texas; Kingman Arizona, and Alexandria, LA. before flying to England on October 17, 1944, where the crew became a part of the 8th Air Force. On November 25, 1944, their B-17 bomber suffered a direct hit by flak while on a mission over Meersburg, Germany. The plane with all members wounded made it back to Luxembourg, where it crashed within three minutes of the American lines. Six members of the crew including Stanley, were killed and three survived. Stanley's remains were returned on the Oglethorpe Victory from the U.S. Military Cemetery in Hamm, Luxembourg. Services at New Boston Methodist Church, Rev. J.M. Ahlstrom officiating. Graveside Military Services at New Boston Cemetery conducted by the American Legion. Funeral services for Edward Walton Histed, 59, of Olathe, Kan., will be held Thursday, July 21, in the New Boston cemetary. Funeral rites were also held Tuesday in Loathe at the Julian Funeral Home. Mr. Histed, a former New Boston resident who operated the Santa Fe Wheel Co. in Olathe, died of a heart attack at 4 pm Sunday July 17, 1949, while driving with his wife. He was born September 10, 1890 in New Boston, a son of Thad and Roxie Histed. He attended school at New Boston, also in Galesburg and at William and Vashti College in Aledo. He was preceded in death by two sons, Walton, who drowned in the Mississippi at New Boston in 1934; and Stanley, who died in the crash of bomber shot down in combat over Germany in December, 1945. His father and one brother also preceded him in death. Mr Histed was at one time connected with Fairbanks-Morse Co. in East Moline and later began work with French and Hecht in 1920 as secretary to William F. Hecht. He served the company as advertising manager from 1930 until 1943, when he joined Thomas and Caster Co. in Keokuk. He went to Olathe with the Sante Fe company in 1946. Mr. Histed was a member of Odd Fellows lodge and the Lutheran Church. Funeral services for Roxie Histed, 89, New Boston, who died April 8, 1957, at 1:30 pm at Mercer County hospital, Aledo, were held today, Wednesday, at 2 pm at the Methodist Church New Boston, with Rev. John Keller officiating. Burial is in New Boston Cemetery. In 1890, she married Thad Histed in Millersburg. She was a Gold Star mother, charter member of the New Boston Christian Church, and the oldest member of the R.N.A. camp in New Boston, in which she was an active member for a number of years. She is survived by two daughters-in-law, Mrs. Grace Histed of New Boston and Mrs. Minnie Histed of Olathe, Kan.; two grandsons, Troy Histed of Dixon, ILL., and Roger Histed of San Manteo, Calif.; two great granddaughters, Miss Linda and Andrea Histed of Dixon, ILL.
She was preceded in death by her husband in 1945, two sons, Ed and Sly Histed, and two grandsons, Watson (I think it's suppose to be Walton) and Sgt. Stanley Histed. Pallbearers at the funeral were Mack Mannon, Lawrence Banjay, Harry Prell, John Prell, Burr Riley and William Riley. Olin Funeral home, New Boston, was in charge of the arrangements. Lloyd J. Nelson, 65, of New Boston died at the University of Iowa Hospital at Iowa City Friday, January 27. (1966) Mr. Nelson had been a patient at the hospital one week. Funneral services were held Monday ay Olin Funeral Home, New Boston, with the Rev. Robert J. Creager, St. Mary's Catholic Church, Keithsburg, officiating. Burial was at the New Boston Cemetery. Mr. Nelson was born near New Boston December 1, 1901 and was the son of Nels and Ora Myers Nelson. He attended New Boston schools and September 14, 1928, he married Kathryn Kane at St. Paul. He was a member of the New Boston Methodist Church. He leaves his wife, a daughter, Mrs. Lorraine VanHook, and a son, Lloyd Jr., both of New Boston; one grandson, Michael Anthony (Tony) VanHook, four brothers, Lester of Monmouth; Edward (Ellis) of Moline, Carl and Earl, both of New Boston, and a sister, Miss Irene Nelson, New Boston. Funeral services for W. Kathryn Nelson, 80 of New Boston, will be held at 10:15 am Friday at the Olin-Jinks Funeral Home, New Boston and at 11:00 am at the St. Mary's Catholic Church, Keithsburg. The Rev. John Weishar, pastor, will officiate. Burial will be in New Boston Cemetery. Visitation will be Thursday afternoon and evening at the funeral home. The rosary will be recited at 7:30 pm Thursday. Memorials may be made to St. Teresa's Catholic Church, New Boston. Mrs. Nelson died at 8:45 pm Tuesday, October 18 at Mercer County Hospital, Aledo. The former W. Kathryn Kane was born February 12, 1903 in St. Paul, MN, the daughter of Bartley and Kathryn Mannion Kane. She married Lloyd A. Nelson September 14, 1928 in St. Paul MN. He died in 1967. They moved to New Boston in 1945 from Wisconsin. She had been an inspector at Formfit Co., Monmouth, from 1954 until 1965 when she retired. She was a member of St. Teresa's Catholic Church, New Boston; the Alter Society of the church; and the American Association of Retired Persons. She is survived by one son, Lloyd Nelson of New Boston; a daughter, Mrs. Lorraine VanHook, New Boston; one grandson; and a sister, Mrs. Anne Adams, of Port Angelos, WA. She was preceded in death by her husband, one sister, and one brother. KEITHSBURG - G. Dean Nelson Jr., 41, went to heaven to be with his grandpa, Sonny Brown, on Sunday, March 27, 2011. He died at his home in Keithsburg that he shared with his girlfriend, Melissa Davis. Dean lived in either Keithsburg or New Boston all of his life. Service will be at 1 p.m. Friday, April 1, at New Boston United Methodist Church, with the Rev. Beth Nelson officiating. Visitation will be 4 to 7 p.m. Thursday, March 31, at New Boston United Methodist Church. Burial will be in New Boston Cemetery. In lieu of flowers, memorials may be left for the family. Dennison Funeral Home, Aledo, is in charge of arrangements. He was born April 14, 1969, in Aledo, the son of Gerald and Roxann Nelson. He graduated from Westmer High School in 1987. He had worked for Murphy Brothers. He was an avid sports fan and loved to fish. He loved life, never met a stranger and dearly loved his children. He will be sadly missed by everyone whose life he touched. Surviving are his daughters, Allissa Nelson of Seaton and Kimi Nelson of Joy; his son, Gerad Nelson of Joy; his mother, Roxann Nelson of Keithsburg; his father, Gerald Nelson of Keithsburg; his brothers, Mick (Kim) Nelson of Milan and Todd (Nora) Nelson of Aledo; nieces Kendra and Briana and nephews Zachary and Chase; his grandmother, Lou Brown of Muscatine, Iowa; his girlfriend, Melissa Davis of Keithsburg; and several aunts, uncles and cousins. He was preceded in death by two grandfathers, a grandmother, several aunts, uncles and cousins. Mary (Compas) Nelson, 100, of Joy, died Monday, July 18, 2011, at the Mercer County Nursing Home, Aledo. Funeral services will be 10 a.m. Thursday at Speer Funeral Home, Aledo. Burial will be at New Boston Cemetery. Visitation is from 5 to 7 p.m. Wednesday, at the funeral home. Memorials may be made to the Mary Nelson Memorial Fund. Mary Compas was born on Oct. 10, 1910, in Nekoma, Ill., to Antonio and Mary Delgado Compas.She was educated in New Boston Schools. She graduated from Eastern Iowa Community College of Nursing in 1965. Mary married Edward Nelson on Nov. 7, 1935. From this union, six children were born. They later divorced. Ed preceded Mary in death. Mary was an LPN with both the VA Hospital in Iowa City and Mercy Hospital, Davenport. Mary was a member of St. Catherine's Catholic Church, Aledo. She enjoyed crocheting, reading and working outdoors. Mary enjoyed dancing in her earlier years. She was a devoted mother and grandmother who cherished the time spent with family. Those left to cherish Mary's memory include her children and their spouses, Arthur "Sonny" and Carol Nelson, Montour, Iowa, Stanley "Twerp" and Pam Nelson, Viola, Thomas Nelson, Joy, Elaine and Kenneth Dixon, Joy, and Betty Thompson, Viola; 16 grandchildren; 25 great-grandchildren; 11 great-great-grandchildren; three sisters, Bessie Ramsey, New Boston, Josephine Hillbert, Moline and Juanita "Teenie" Wheeler, Milan. Mary was preceded in death by her parents; a son, Donald "Butch" Nelson; a son-in-law, Darrell Thompson; and two brothers, Frank and John Compas. If You Have family info, photo's, ideas to share PLEASE be sure to contact me.....our family history will not be complete until you contact me!